The theme for my Cricut Message Board ATC group this month was "brown paper bag" with this stipulation, "entire ATC must be utilizing brown paper in some way shape or form..."
This was a theme that gave me a hard time - I kept thinking of things like making tiny brown bags and putting something inside of each but I wasn't ready to commit to making 14 tiny bags(!) So I thought about it for a while and realized that "brown paper bag" was making me think of "plain brown wrapper." When I was younger (back in the day when TV ads for personal hygiene products and drugs for "performance problems" were unheard of), some products were advertised as items that would be sent through the mail in a "plain brown wrapper" - presumably to spare the purchaser from any embarrassment. 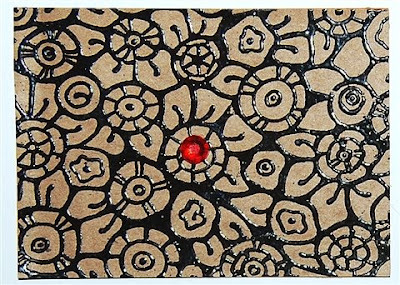 I recently bought a rubber stamp that I thought looked a bit like lingerie lace so I decided that I would use this for my ATCs. I imagined that racy black lingerie might have been something sent in a "plain brown wrapper." I cut up an actual brown bag from the grocery store for the cards. 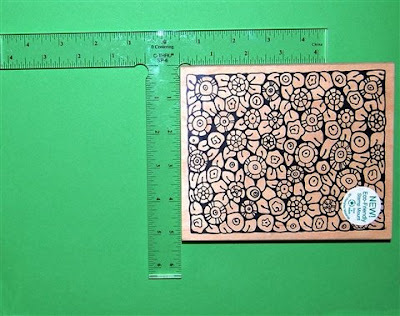 For the fronts, I cut the pieces at ATC size (2.5 x 3.5 inches) and then, using my stamp positioner (shown in the photo above), I stamped the pieces of brown paper with Versamark ink and heat embossed the design with glossy black embossing powder. By using the stamp positioner I was able to stamp each ATC with the same portion of the stamp to make them as identical as possible. 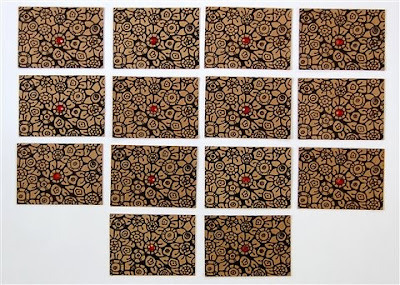 Above you can see all 14 ATCs. I added a red gem to my "naughty" lace for a bit of sparkle. 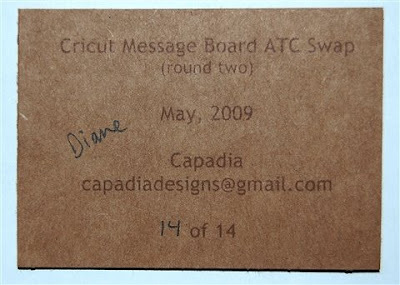 For the backs of the ATCS, I printed the usual information in dark brown. I cut pieces of the brown paper bag at 8.5 x 11 inches and just ran it through my computer printer - it printed perfectly. There were nine backs on each page and I trimmed them to the proper size after printing. Above is a closer view of the ATC backs. 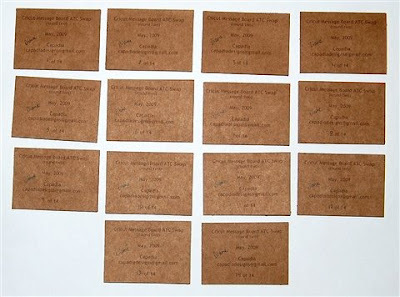 Since the paper bags are thick but still rather flexible, I adhered the fronts and backs to pieces of brown cardstock cut to ATC size to make them sturdier. This was an interesting theme and fun to do once I finally had an idea. The other ATCs are in the mail on their way to me and I am looking forward to seeing all the interpretations of this theme. I did have a sneak peek at them on KER's blog (Karen is our organizer). If you would like to see all of the ATCs for this theme, here is a LINK to part one and a LINK to part two (she did two posts to allow for larger photos with fewer ATCs in each photo for a better view). I really like the way the embossing worked on the brown bags and I think I will try this again for some cards. Left you a little something on my blog go and grab it :) thanks for all your inspiration! !